Note: that Urban Futures 2007 calculated the 2006 regional population to be 144,317 - this was used as the starting point for growth projections calculated for the 2011 Regional Growth Strategy. The population of the region increased from 77,624 residents in 1981 to 155,698 residents in 2016. This means an increase of 100% during that time at a growth rate of approximately 2.7% per year, on average. Population growth rates in the Regional District have fluctuated over the past 35 years during different census periods. These highs and lows are the result of a range factors including migration, aging as well as births and deaths. A population and housing study conducted by the RDN in 2007 (Urban Futures 2007) estimated a 2006 population of 144,317 residents and used this as the basis to calculate future population growth. The study forecasts a population increase of 60 percent from 144,317 residents in 2006 to 231,184 residents by 2036 (BC Statistics, www.bcstats.gov.bc.ca, Urban Futures 2007). The study forecasts that the region will "grow at a slowing annual rate from roughly two percent today (2007) to just under one percent by 2036" compared to the three to five percent growth rates in previous decades. 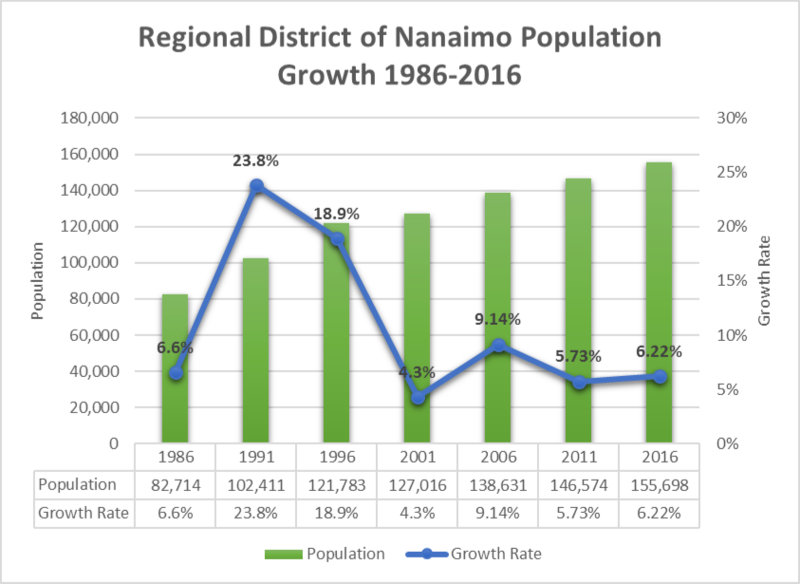 Since this study was done, the Regional District of Nanaimo has experienced lower growth than anticipated with 138,631 residents in the 2006 Census and 146,574 residents in 2011 compared to the predicted population of 158,767. Based on the forecast study and the 2011 Census results, it is anticipated that the Region's population will increase at a slower rate over the next two decades while at the same time growing older. The Region's population has aged significantly since 1986 with the majority of the population now over the age of 45. Between 2006 and 2011 the median age of the Region's population increased from 46.6 to 49.3. It is predicted that the population will continue to grow older with significant implications for land use, housing, services and employment.